Kanpur: Chasing a daunting 434-run target, New Zealand were 93 for four at stumps in their second innings on Day Four of the first cricket Test against India at the Green Park here on Saturday (Sep 24). The visitors need 341 more runs with six wickets in hand and a day’s play remaining. Luke Ronchi and Mitchell Santner were at the crease with 38 and 8 runs, respectively. Tom Latham (2), Martin Guptill (0), Kane Williamson (25) and Ross Taylor (17) were the batsmen to fall in the last session of the day. From the start, the Kiwis batsmen never looked in the contention as wickets continued to fall at regular interval. Kohli started the proceeding with Ashwin, who took two wickets in an over to become the second-fastest to 200 Test wickets in terms of matches (37), beating Dennis Lillee (38), Waqar Younis (38) and Dale Steyn (39). Skipper Kane Willianson was his 200th wicket in this 500th Test India are playing in their cricketing history. Earlier, inspired by brilliant batting of Murali Vijay (76) and Cheteshwar Pujara (78), India extended their overall lead to 308 runs in the first session. In the lower-middle order, Rohit Sharma and Ravindra Jadeja struck half centuries to finish off the proceeding for India. 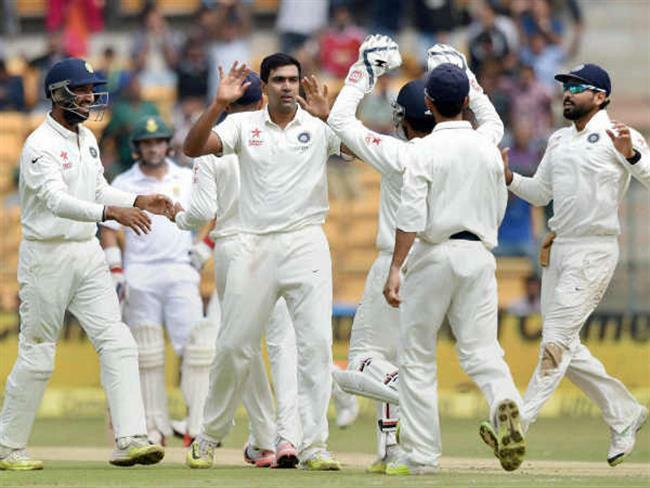 India declared their second innings closed at 377 for five at tea, extending their overall lead to 433 runs. Earlier, resuming the fourth day at 159 for one, overnight batsmen Vijay and Pujara could manage to add only 26 runs to the score as Vijay was trapped lbw by spinner Mitchell Santner in the 57th over. The left-arm spinner had set Vijay up with a big turning delivery, which he followed up with a slider that surprised Vijay, hitting him on his front pad on the off-stump line. Incoming batsman Kohli, who was struggling from the beginning was also sent back to the pavilion by Mark Craig in the 68th over. Both Pujara and Kohli together put on only 29 runs for the third wicket. Three overs later, Pujara too was sent back to the pavilion when spinner Ish Sodhi pitched the ball outside the leg-stump line and made it spin across to get an outside edge off Pujara’s bat. After the wicket, Rahane and Rohit played intelligently, not taking any chances against the spinners and stabilised the Indian innings. Men can identify faithful women from photo!